If you’re going to be in Japan in mid- to late March, you can see sumo in Osaka. Buying tickets in advance is difficult, but you can wake up early and buy same-day tickets at the stadium. Here’s how. Seeing a sumo match is an unforgettable experience. It’s not just the sheer athletic spectacle of two mountains of flesh colliding, it’s the whole atmosphere of the arena. 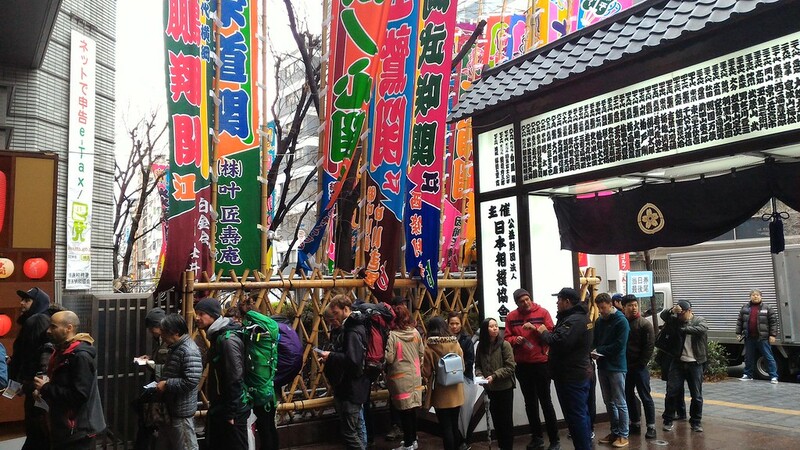 However, it’s not easy for tourists to buy tickets. If you’re organized and your timing is right, you can buy tickets in advance online from the Ticket Osumo site. 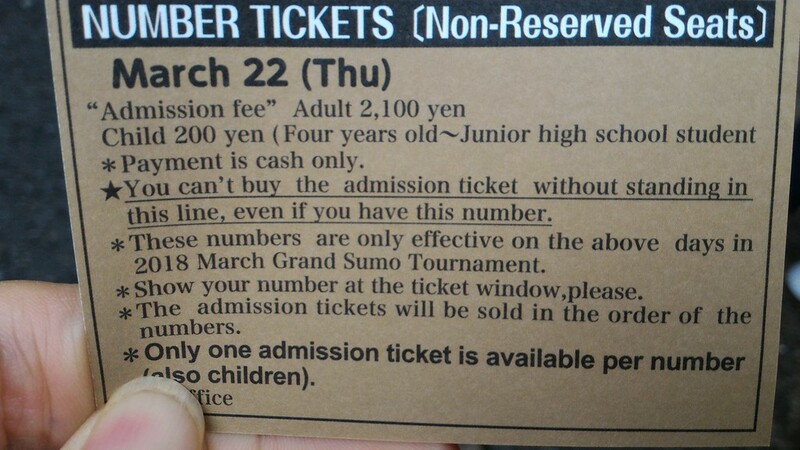 For full details on this option, check out our How to Buy Tickets for a Tokyo Sumo Match (the procedure is the same for Osaka). But don’t despair if you didn’t get tickets online. There’s another way: You can go directly to the arena when a tournament is being held and buy “tojitsuken” (same-day tickets). 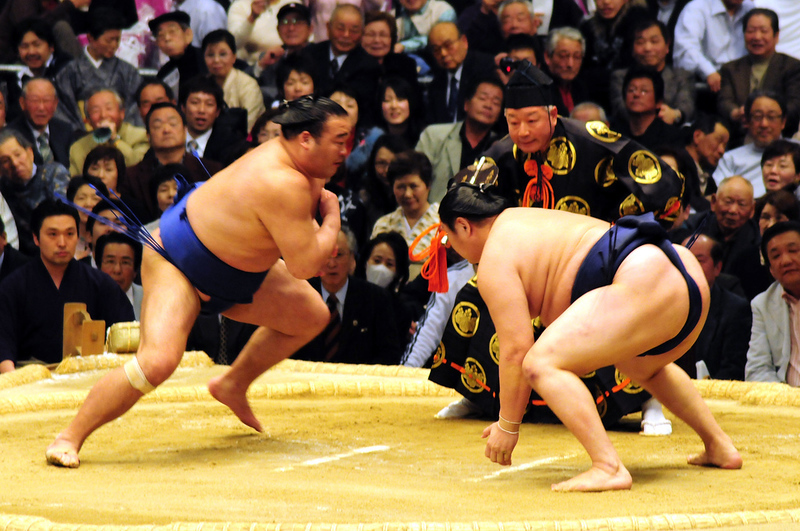 First, check the English sumo schedule to determine the exact dates of the Osaka tournament. It’s held from the second Sunday in March to the last Sunday in March. Note that it’s easiest to get weekday tickets early in the tournament. Later days and weekend days sell out sooner (requiring an earlier wake-up to get tickets). Here are all the details. The March Sumo Tournament is held at Edion Arena (Osaka Prefectural Gymnasium), which is in Namba, in the Minami District of Osaka. The easiest way to get there is to take the Midosuji Subway Line from Umeda Station or Shin-Osaka Station. In order to get tickets, you should get to the stadium around 7am on a weekday and 6am on a weekend or on one of the final days of the tournament. 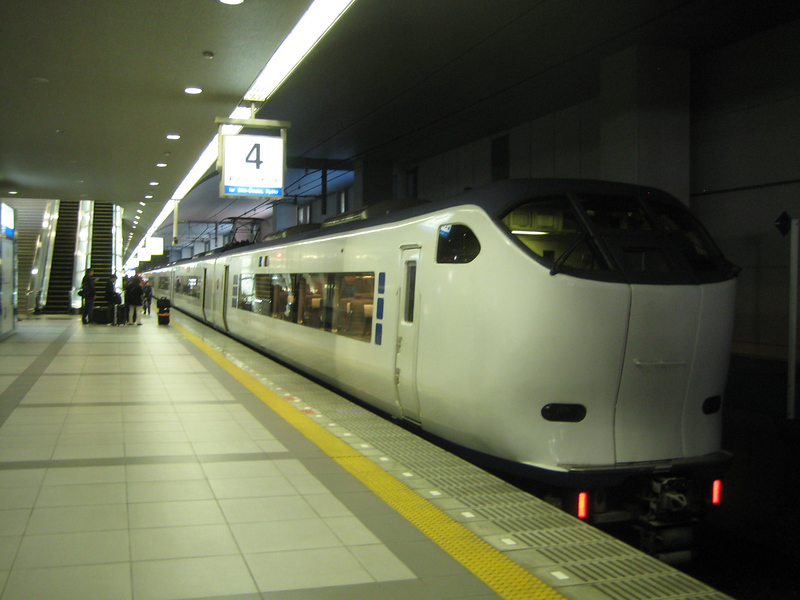 If you’re coming from Kyoto, you can take an early kaisoku or shinkaisoku train on the JR line (these start running just after 5am), or you can jump on the first Haruka airport express train (which departs Kyoto at 5.45am on both weekdays and weekends/holidays). In either case, get off at Shin-Osaka and get on the Midosuji subway line, bound for Namba. 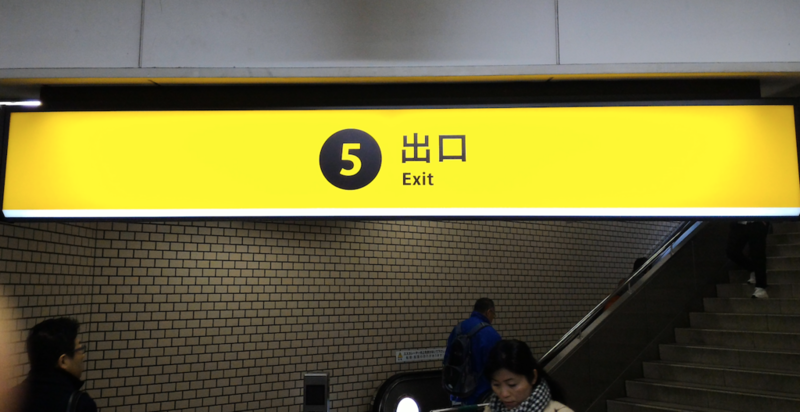 When you arrive at Namba Station, follow the signs for Exit #5. Take the escalator to street level. In front of you, you will see Daikoku Drug Store (see the picture below, since the sign is only written in Japanese). 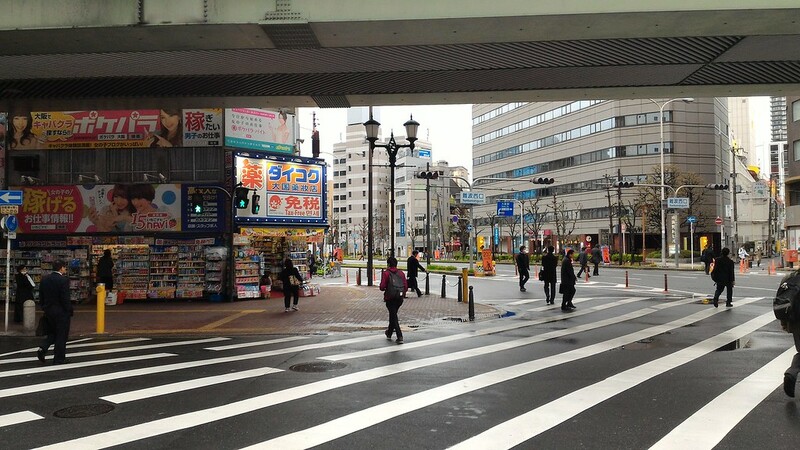 Cross the street and walk past Daikoku Drug Store (keeping it on your left). Walk to the third street and take a left. Walk a few blocks and you will see the Edion Arena in front of you at the end of the street. 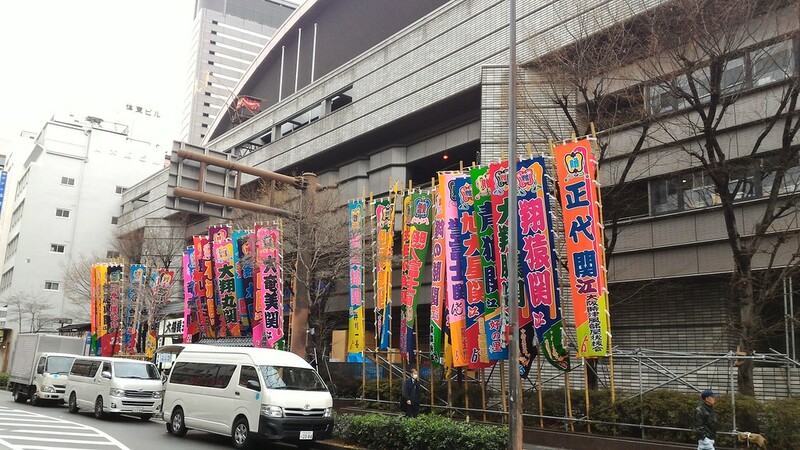 On sumo tournament days, there will be colorful flags in front of the stadium (each flag represents a wrestler competing in the tournament). Facing the stadium, walk to your right and you will find the line for same-day tickets on the right side of the stadium. A worker will be holding a sign showing the end of the line. It reads 当日券最後尾　(tojitsuken saikobi) in Japanese. Line up at the end of the line. 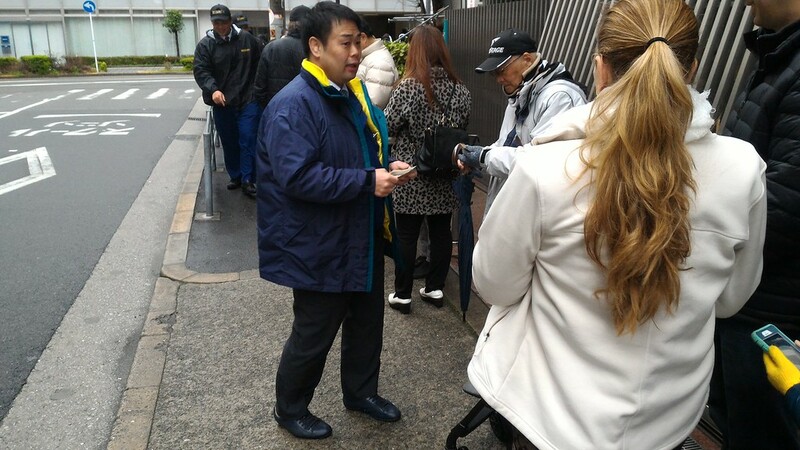 At around 7.20am, workers come around and hand out seiriken (number tickets). These confirm your place in the line. Here’s a picture of the Japanese side of a seiriken. Here’s a picture of the English side of the seiriken. 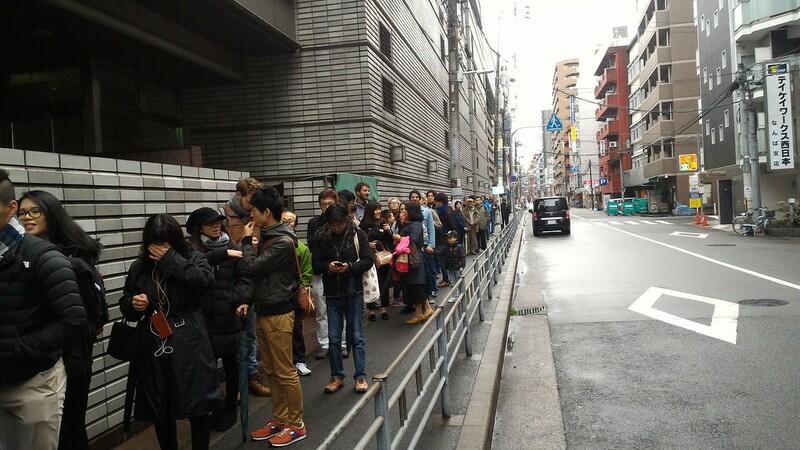 Note that even if you have a seiriken, you cannot now walk away and come back to buy tickets later. You MUST remain on line to buy your tickets. Also note that every person in your party must have their own seiriken (so be sure to get one). The only exception is children younger than four years of age. At around 7.45am, they start selling the same-day tickets. At this point, the line will be allowed to advance toward the ticket windows. There are usually three windows. 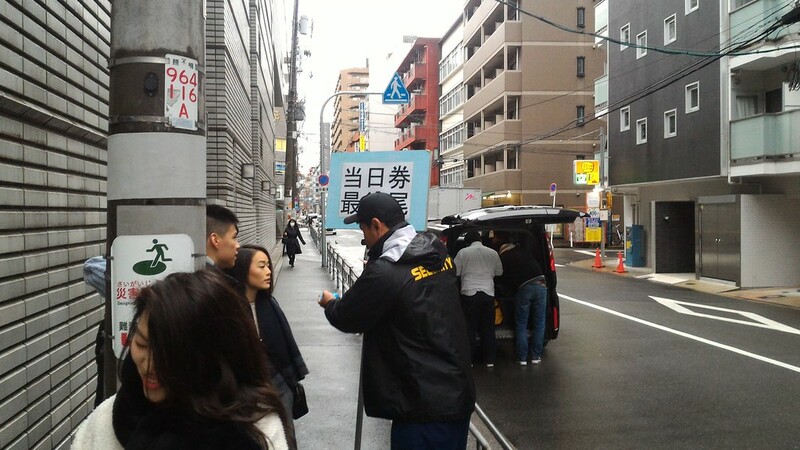 Just before you get to the windows, a worker will check your seiriken. These guys are usually retired sumo wrestlers, so it’s not a good idea to get into a shoving match with them. Once at the counter, you can buy your ticket (remember, one ticket per person only). 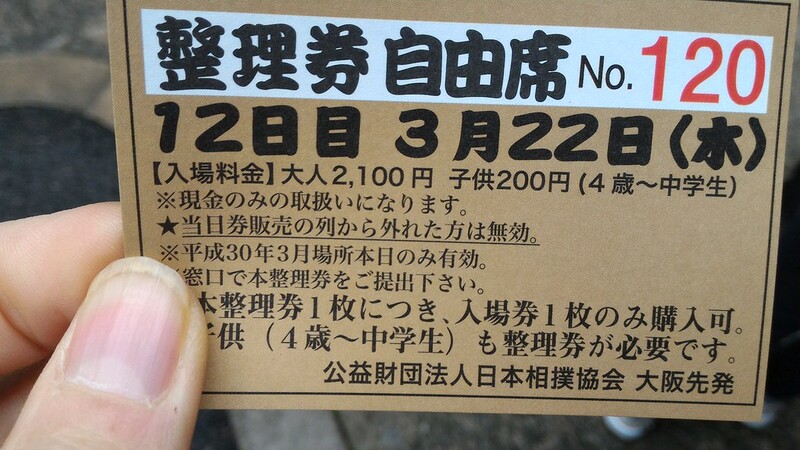 The tickets cost Y2100 for adults and Y200 for children (between the ages of 4 and the end of junior high school). As noted above, children below 4 years of age do not need tickets (but, a sumo arena is not a great place for really young children). 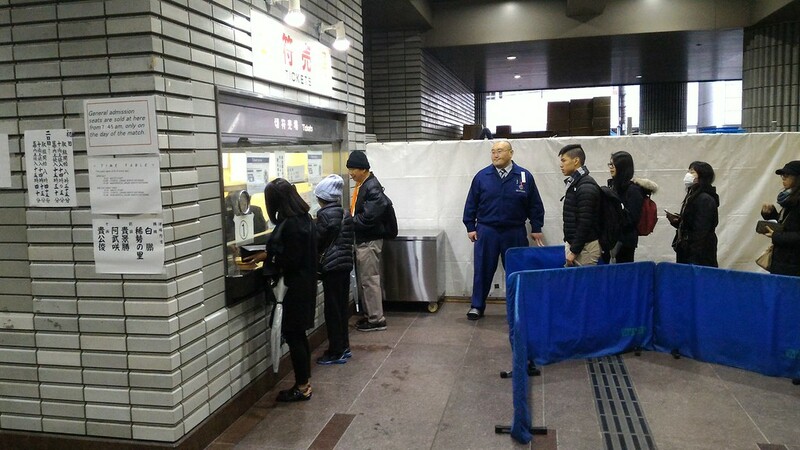 You MUST PAY IN JAPANESE YEN CASH, so be sure to bring enough, because there are no ATMs nearby. By around 8am, the last of the same-day tickets will be sold. 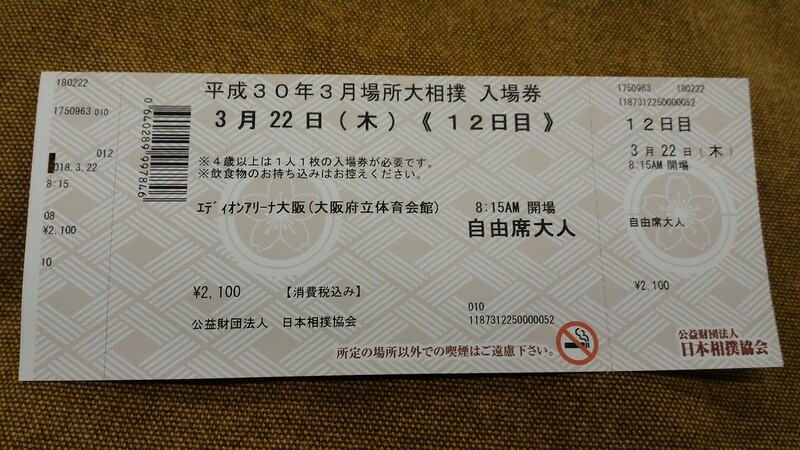 Here’s a picture of an actual same-day ticket (tojitsu-ken). After buying their same-day tickets, some people join the line for entry to the stadium (gates open at around 8.30am). This allows you to claim a decent seat in the unreserved section. However, you’ll wind up hanging about until early afternoon, when the action starts. Thus, I recommend just going back to your hotel and taking a nap. Then, do some sightseeing. And then return to the arena around 4pm, which is when the upper-rank wrestlers enter the arena. 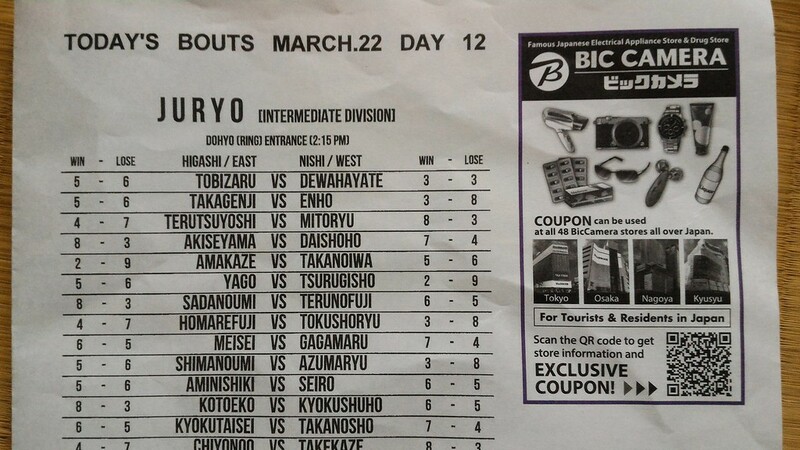 When you enter the arena, you will see people handing out match schedules. Some of them will be handing out English-language match schedules. Grab one of these. Usually, they’ll offer them to anyone with a foreign face. They’re free. Head up to the third level. There are usually plenty of guides around to give directions, including a few folks who speak English. 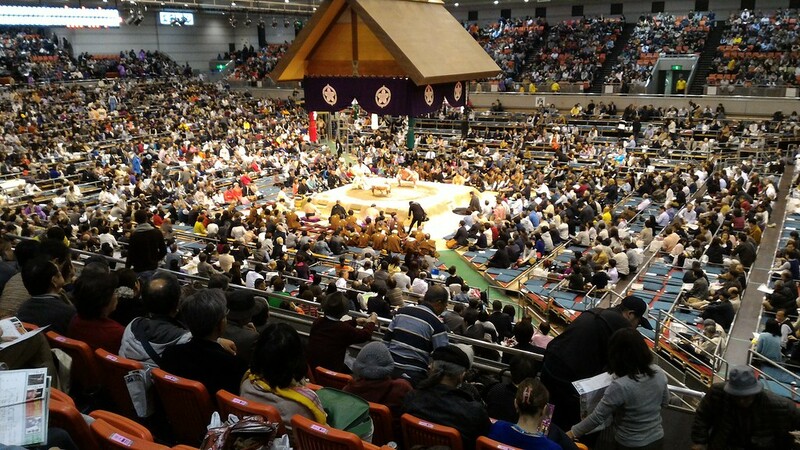 Upon entering the arena, you’ll be greeted by the awesome sight of the dohyo (ring) and the ceremonial roof above it. This is surrounded by the masu and tamari seats, which are box seats where people sit on the floor. Behind these are the normal upright reserved seats. 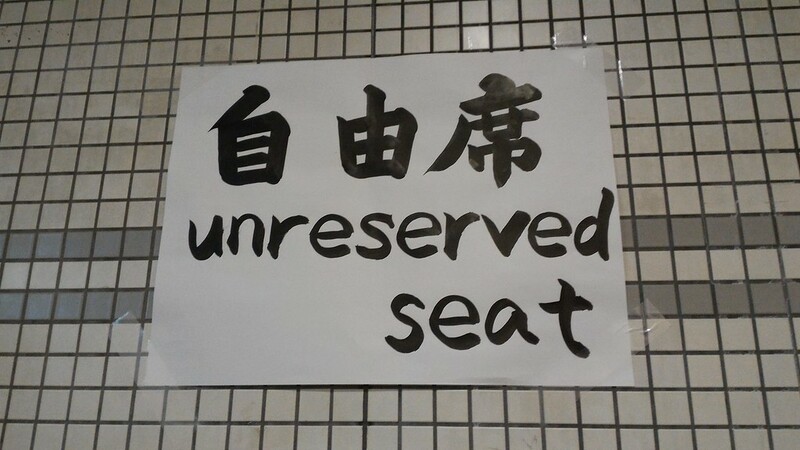 For those with same-day tickets, the only seating options are the areas marked “自由席 unreserved seat”. These can be found at the ends of the third-level. Sometimes, people have left things on the seat to hold them until they return to the stadium later. This is a dodgy practice, but it’s kind of hard to remove the stuff and sit there, because you’ll be waiting for those people to return and worrying that they might be giant hulking gangsters. So, it’s better to look for truly open seats. There are also small sections at the very end of each side of the third level with no seats, where you can sit on the floor. No matter where you sit in the unreserved section, you’ll be far from the action, so consider bringing binoculars. At 4pm, the upper-rank wrestlers enter the arena. There is a colorful ceremony to mark their entry. This is when the action really starts. For the next two hours, you’ll be watching the best wrestlers competing against each other. The last bout finishes around 6pm. 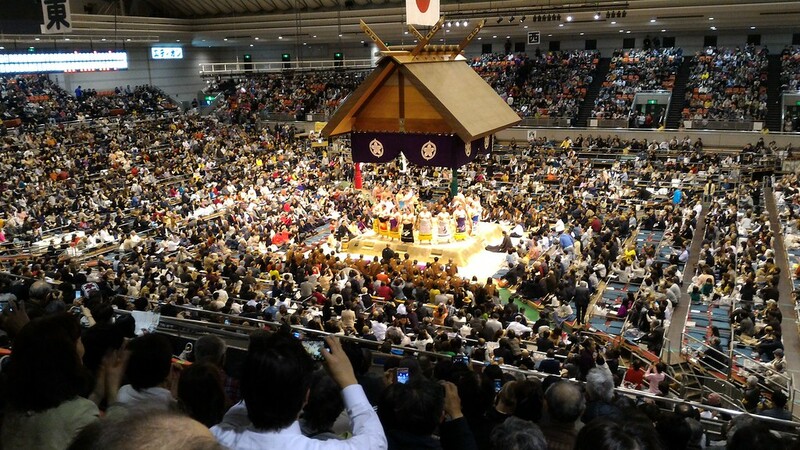 For information on how to buy sumo tickets in advance for any tournament in Japan (including Osaka, Tokyo, Nagoya and Fukuoka), as well as information about how to buy same-day tickets in Tokyo, see How to Buy Tickets for a Tokyo Sumo Match. If you’d like to stay in Osaka to be nearer to the stadium, check out our Where to Stay in Osaka page. 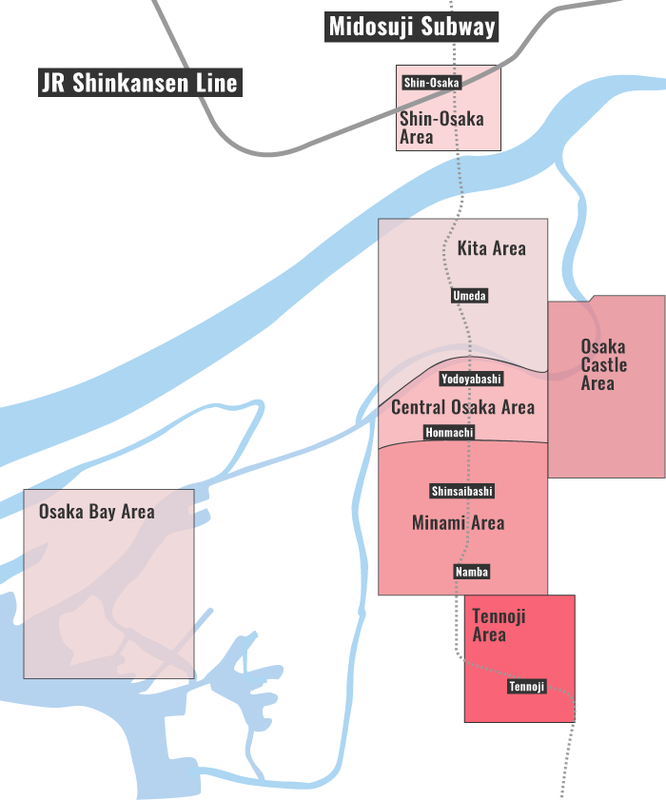 For some recommended hotels in Osaka, check out our Osaka Hotels page.